Our Loyalty/referral program is aimed to save clients’ money on plumbing repairs! Have you ever noticed how many companies offer discounts, promotions or savings for new customers but don’t offer any kind of reward for remaining a loyal customer? I have, and to be completely transparent, it ticked me off. I was a client of a satellite company that shall remain nameless for more than 12 years. I called them and asked for them to match my current bill with what they were offering new clients, can you believe that after 12 years of loyal service and paying my satellite bill every month they refused to give me the same pricing as a new client? I was shocked and understandably frustrated. I am grateful to this satellite company now, they inspired me! This frustrating experience and the feeling of being unappreciated for my years as a loyal client inspired me to take action with my own business. 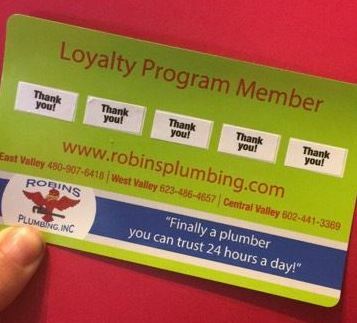 This experience launched the Robins Plumbing Loyalty Program. We want to show our thanks and appreciation to our loyal clients that use and refer us by sharing with them great savings on quality plumbing services they already appreciate and enjoy. Our loyalty program isn’t just geared at our clients using us personally, our loyalty program doubles as a referral program! Want to get that 25% discount even quicker, refer us to friends, family, and colleagues and get credit for their service as well. What would you use your 25% (up to $200.00) discount on? A new water heater, a new water softening system, maybe a new fancy touch-free faucet in the kitchen? If you haven’t signed up for our loyalty program it is quick and easy, just click here to be guided to our online form on our website.